My friend Simi Fajemirokun started an annual West African road trip last year. Whilst i still haven’t joined her on any of the trips yet, here is a little piece she did on the experience. In this era of blackberry messengers; watsapp; social media and mobile money, traveling smart seems like the most normal thing to do. So why would anyone who has a choice, choose the arduous and possibly dangerous route to travel by road. Is it because of the perceived hundreds of miles of the African scenic coastline? Maybe not, most of rural West Africa seem to look the same so far. Then, it must be because it is convenient? But then again, that is if you don’t mind the possible road sickness from the heat and cramps that develop in your feet. So, is it due to the fact that it’s cheaper? Well, yes, that’s a definite plus. It costs an estimated USD160 (round trip) to travel by road and USD1700 (round trip) by air via Ethiopian airlines, flying from Lagos to Abidjan. That’s about 90% savings in total. All in all, that’s not enough to convince the average Joe to get on the road for a day and half’s journey from Lagos to Abidjan with too many unknowns. Now that is what peaked my curiosity. Why are there so many unknowns? Why don’t we West Africans travel more within the region? Why is it cheaper and faster to fly aboard European Airlines from Lagos to Europe than to go from Lagos to Abidjan? Why don’t we trade more? According to the World Trade Organization 2012 report, intra-Africa trade accounts for only 10% of Africa’s total trade. This greatly hinders growth and development across the region. In Nigeria, for example, I get to buy Senegalese kaftans from a local boutique and Ghanaian leather slippers from the market. Therefore, there must be some type of movement of people and goods. But, it is nowhere close to where it could and should be. So why did I set out on this journey? Even though this Abidjan trip was a follow-up from the 2012 Abuja to Accra road trip, I still felt the same level of anxiety. This was due to the many warnings of security issues at the Ivorian borders (due to the incessant attacks still emanating from the previously concluded civil war). Also, the rumors that rebel groups were still in charge at the border made one very uneasy, but the lure of an adventure kept me excited enough to get on the road again. This paid off in the end as I am now in love with the City of Abidjan (otherwise known by some as “little Paris, city of dreams”) and would love to visit as often as possible. The journey was an amazing one filled with lots of unforgettable experiences. Travel time from Lagos to Abidjan was approximately 20 hours in total, however, we broke-up the journey in Accra. I’ll have to borrow from MasterCard’s theme about moments in life being priceless. 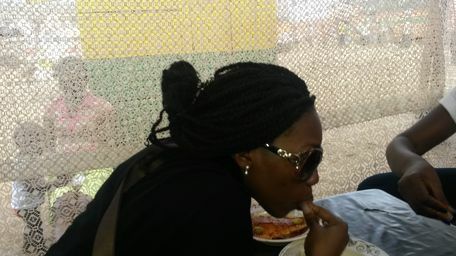 Eating Banku and fish at the Aflao (Togo/Ghana) Border was simply priceless. 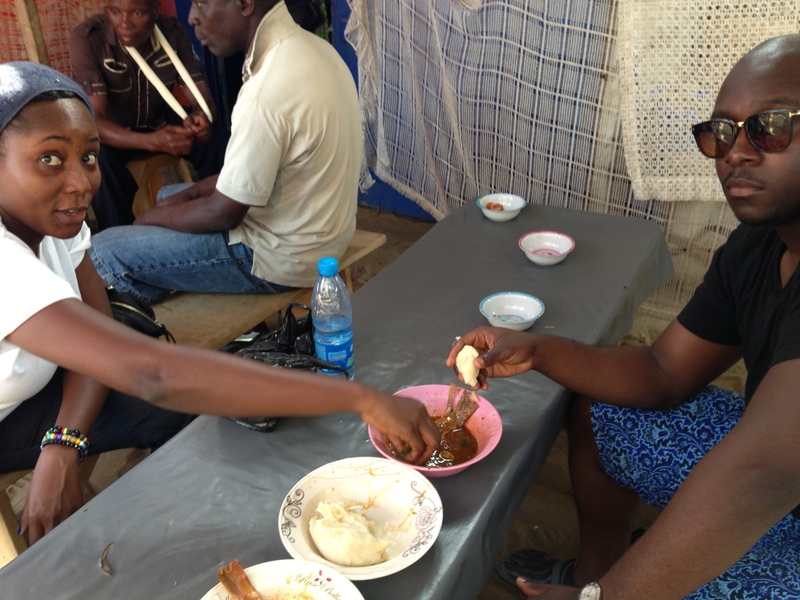 Our Ghanaian guide/driver from Lagos, Mr. Brown kindly treated us to this sumptuous motor park meal. I must admit my cousin and I arrogantly rejected Mr. Brown’s offer to eat but watching my brother savoring every taste prompted us to delay no further in washing our hands and diving in. My fantastic holiday planner and fellow global shaper, Ms Nadia included a stopover in Cape Coast in our itinerary and a visit to the Elmina Slave Castle. Journeying through the tower was simply priceless. It was an extremely humbling experience that makes you appreciate the freedom that we so easily enjoy. We stayed at the Coconut Grove Beach Resort. The Cape Coast trip also included a trip to Kakum National Park where we spotted a fellow Nigerian holidaymaker screaming Jesus songs from the canopy walk way (which is 350 meters long and connects seven tree tops of the forest). As he wobbled fearfully and frantically he paused in between the Jesus Save Me Songs to blurt out ‘Warri no dey carry last’. See how we Nigerians make it easy to find ourselves as well as entertain those around us. With a full day of activities spent at the Cape Coast (Elmina Slave Castle and Kakum National Park) we naively assumed that we could take a night bus to Abidjan on the same day. So, we super troopers embarked on this unknown journey to Abidjan. We were worn out from the day accompanied by the unpleasant cramped bus from Takoradi to Elubo (Ivory Coast border), which put us in a terribly bad mood. As darkness crawled in and engulfed the day, we realized how foolish it was to set out to an unknown place at night where language was a barrier. The unlit bumpy road with an overloaded bus made a great combination for worse things to happen. One was too scared to sleep and too paranoid to see through the darkness. We kept saying to ourselves “maybe we should go back- but to where”? We finally got to the Elubo border (border between Ghana and Ivory Coast) at 9:30pm after a frightening three hours of a dark uneasy ride. Then, we were told even more interesting news that the drivers at the bus terminus in Takoradi conveniently forgot to tell us. The border closes at 6:30pm and reopens at 6:30am for security reasons. So we were stuck in pitch darkness in a border town that spoke no English except for heavily accentuated French and the local dialect. At this point, the overwhelming sense of fear emotionally consumed us. Some man who kept trying to warn us, by connoting varying expressions of how our heads would be chopped off, if we attempted to cross the border, at that hour, further heightened this feeling. An elderly market woman seating next to the man, seeing our dismay and confusion, got up suddenly, took our bags and signaled that we should follow her. This happened suddenly and silently, without any warning. To our surprise, we briskly jumped up forgetting all the pains in our bones and straggled along in her wake. We walked through an open field in pitch darkness and through crooked crevices, which seemed to be the back of old, rustic buildings. Finally we made a stop at what barely qualified to be a motel of some sort. So, at least, she wasn’t taking us for human rituals J. Unfortunately, the semi-motel was full. We pleaded desperately to stay in the reception area till dawn but the steward refused. So this woman, our new found guide, picked up our bags again in silence and kept walking till we got to a fairly decent hotel where we spent the night. We spoke English, she spoke French but human kindness surpasses any language or physical barrier. This silent act of kindness was simply priceless, as she refused to take our thank you tip and ran back unto the dark road, before we could even chase after her. We vowed not to sleep but stay awake till 06:30am when we would then take off to Abidjan. But staying wide-eyed through the night seemed an impossible task. We eventually ran out of primary school gist and staring at a blank 1960’s TV screen didn’t provide much solace. The receptionist slapped and banged the TV several times as she attempted to bring it to life. She insisted it must work as she wanted us to watch with her the Big Brother Africa show (Africa’s popular reality TV show), but it still didn’t work, to our amusement. We ended up sleeping on our elbows as we tried to avoid the stained fuzzy sheets. We got-up early to start our journey and the receptionist was very pleasant as she tried to get us a known guide/driver to take us across the border and into Abidjan. The drama of getting a car and driver seem to be the same from coast to coast. The combination of the actual driver, touts, money agents, marketers and hype men always make for an amusing process of simply getting into a car. Also, the idea of getting down and physically walking across the border while the driver meets you on the other side seems to be the norm along border crossings. That jittery feeling when an unknown driver with your luggage in his car, requires that you trust him to meet him on the other side of the border is always dispelled, luckily. We’ve done it several times and the drivers always show up on other side, sometimes albeit later than your calm disposition can bear. 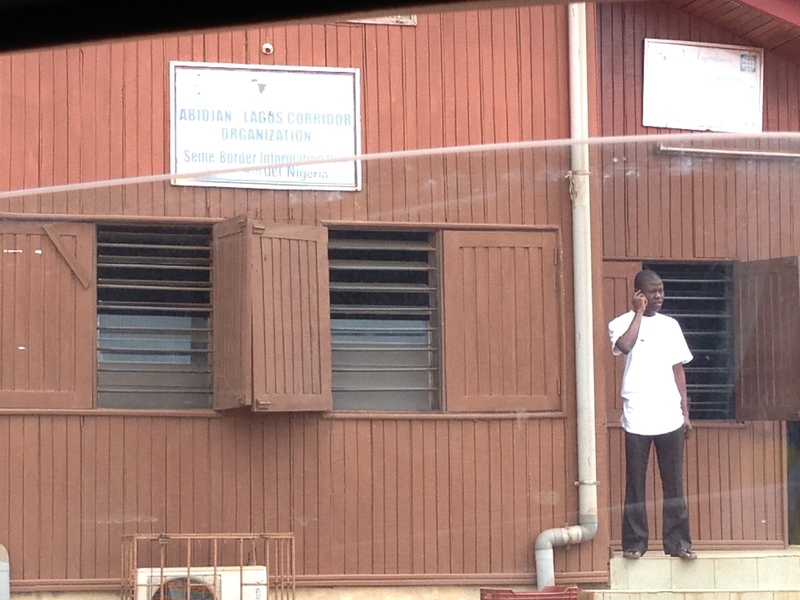 We got into Abidjan at midday and it’s a quaint, charming city with an European and African flair. I saw several corporate women with skirt suits made with African prints that embodied the infusion of both worlds. The food (plus heavenly French desserts) and service at the hotel was great. Also, Ivoirians seemed to be huge fans of P-Square (famous Nigerian afro-pop artists). From the cabs to the nightclubs P-Square filled the airwaves. It was a nice comfort to our inability to speak French, acknowledging we are from P-Square’s country brought on a smile each time. Thank you P-Square. The Hotel Novotel where we lodged also compensated largely for the long journey as it was situated alongside the Ebrie Lagoon, which gave us a great view of the city and business district. Majority of the hotels were full due to the Afri-basketball tournament holding at the time. So we were lucky to have our second option as our first, hotel Pullman was sold out. At night the streets have the heavenly aroma of sweet warm chocolate that tease your senses immensely. It feels like choco-heaven, if only the strong whiff led you to one. This might have something to do with Ivory Coast being the largest producer and exporter of cocoa in the world with many processing plants in the city. After, plenty back and forth as we debated where to start our night out (from hotel Pullman to rue Mercedes), we finally ended up in a small Karaoke bar, the Blue Coconut. We were bombarded by painfully, gay, French, romantic songs being sung by hopeless singers. My brother instantly became the star of the night as he effortlessly rapped through Jay-Z’s encore. My cousin and I must have felt we were in church as we plunged through Mariah Carey and Whitney Houston’s ‘when you believe’ song. We were probably pumped by the awesome crowd response to my brother’s star performance. Well we didn’t quite make it, as we ended up looking like spirit-filled choirmasters who changed the vibe of the club. But our follow-up song with Rihanna’s ‘What’s my Name’ gave us back our street credibility and got the DJ giving us shout-outs as he butchered our name in French, another priceless moment. Nonetheless, it was a great start to the night and we went to 2 other clubs (V.I.P& Life Star) where there was great music (Francophone techno, high-life) and interesting people with lots of French expatriates dancing rhythm-lessly. 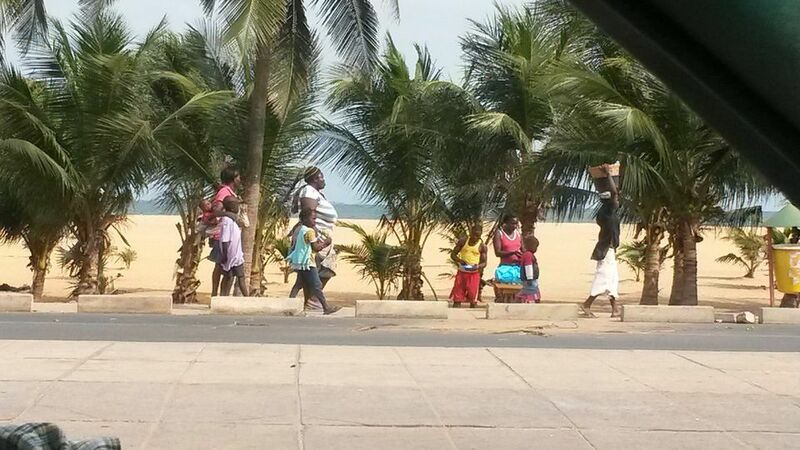 All in all, Abidjan was very cosmopolitan, progressive and beamed of the modern African pride. I wish we stayed for much longer but I definitely will be seeing that charming city very soon. Why do I go on these road trips? The answer is simple. The experience is priceless. Africa is beautiful and there’s so much beauty to be seen. From the kind tough love from strangers to the amusing banter with immigration officers, police, hawkers and drivers to the insignia of pleasant green scenery especially around coastal areas. This makes me love my continent, country and people, even more. I just hope that my kids will make such trips with much more ease and choices at their disposal. I pray they can experience Africa via road, rail, air or sea. In the mean time, for Road Trip 2014 – Liberia & Sierra Leone, here we come! P.S this trip was made without my Nigerian passport but with my Nigerian driver’s license so there is free movement of people in the ECOWAS region (a little bit of tipping helps along the way). Also, minimum travel cash is required as your VISA/MASTERCARD works in most places. Lesson- Never Give Into Your Fears. They Are Mere Illusions!